We'd like children under 14 to bring in a short story on this subject. The deadline is October 8th and the winner will be announced on October 10th. 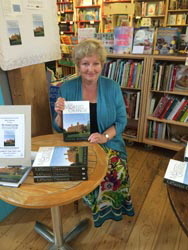 Diss Publishing Bookshop was thrilled to host the launch of “The Moated Grange” by Elaine Murphy. When Elaine fell in love with the 14th century moated, timber-framed house she had no idea that its history was so extensive or meticulously documented. “The Moated Grange” is the story of a Norfolk house told through the story of its various owners and provides a fascinating social history of rural England. 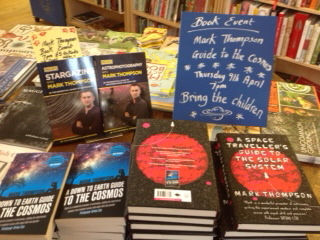 Photographs from our recent event with Mark Thompson. 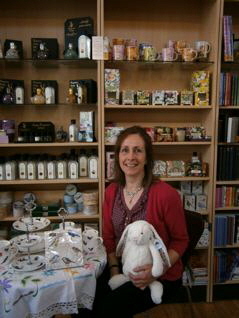 Our guest author for the Big Bookshop Party! 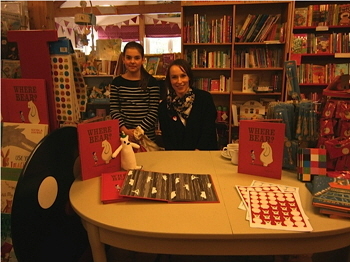 World Book Day Illustrator 2015, Sophy Henn, with the two winners of our ‘Books Are My Bag’ short story competition, Nell Talbot and Evie Bloom. Congratulations! For children under 12 years old only! Hand your story in at the bookshop by Wednesday October 8th with your name and phone number. 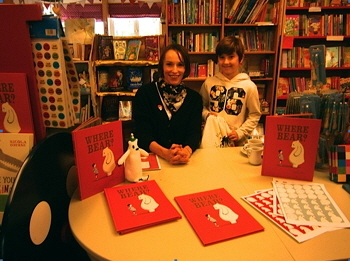 Sophy Henn, author of 'Where Bear?' will present the prize on Saturday October 11th at 1pm – a 'Books are my Bag' bag full of goodies! Congratulations to Diss Publishing employee, Helen, who has been nominated for The Great Gifts Retailer of the Year Awards Employee of the Year. She is one of five nominees in the category nationally. The prestigious awards ceremony will take place at the Savoy Hotel in London, on 8th May. 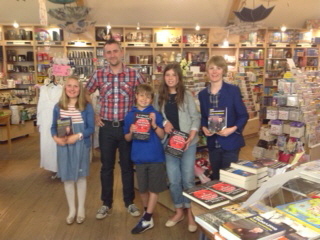 Diss Publishing held an exciting literary event to celebrate World Book Night. Ronald Blythe (Akenfield; At the Yeoman’s House), Elspeth Barker (Dog Days; O Caledonia), and Oliver Bernard (Verse etc., Arthur Rimbaud) joined us to talk and read, not only from their own work, but also from books they love. Guests had the opportunity to put questions to the authors and have their books signed. Website designed, managed and hosted by DataTech D.T.P.